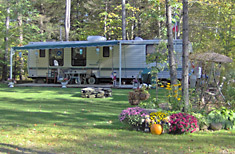 Peppermint Park Camping Resort is located on 80 acres of wooded and grassy hillside in the Berkshire Hilltowns of Western Massachusetts. 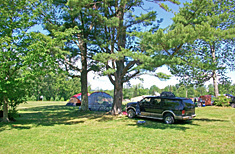 Our spacious campsites are mostly full hookups, with many of our campers seasonals who treat Peppermint Park like their home away from home. We hope to make your stay with us a pleasant and peaceful camping experience. Our rates are based upon 2 Adults and 2 Children. One camping unit and one family per campsite. Daily and weekly reservations are available during the summer season only. Holiday weekend reservations require a 3-day minimum, are non-refundable and non-transferable. Check-in time is between 1:00PM and 9:00PM. Check-out time is before noon. If your site is available, you may check in early or stay late for an additional $15.00. 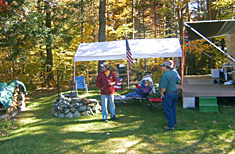 Visitors to registered campers may enter between 10:00AM and 8:00PM, and must exit by 10:00PM. Overnight guests must check out by 2:00PM next day. You are encouraged to use the following on-line form in order to request a reservation at Peppermint Park Camping Resort. We will make every effort to respond to your request as promptly as possible, generally within 24 hours. Please understand that this is strictly a Reservation Request Form. You do not have an actual reservation until the availability of space has been confirmed and the appropriate deposit has been paid. If space is not available for the date(s) requested, we will convey our regrets via e-mail. If space is available, we will contact you with a tentative confirmation which must be followed up by your payment of the appropriate deposit. For this reason, it is necessary for you to include a valid e-mail address with all reservation requests, and it will be your responsibility to check your e-mail in a timely manner. For your convenience, we accept Visa, MasterCard and Discover. We suggest that you phone us with your credit card information at (413) 634-5385, during normal business hours. You may also send us payment through the mail via personal check or money order within 14 days of the time of your original reservation request. Please be aware that you do not have a confirmed reservation until your deposit has been processed. To avoid disappointment, reservations should be made well in advance of your expected visit. If you need to confirm your reservation immediately or would like to make a reservation for an arrival within less than 48 hours, please call us during normal business hours. Once again, please remember that you do not have a final reservation until your deposit has been processed and authorized. Please complete this entire form prior to pressing the “Submit” button. Items marked with an asterisk (*) indicate required fields. We thank you for choosing Peppermint Park Camping Resort … and we look forward to your visit! Important: Yo1u may dbebf makeing use ofb b65automatedf12 form3-ffcail3ling so0ftware. This t1y2p8344e of softw8are can4 triag8ger1 our 5h8iddden s4pam-det919ecftiond systbem0f, whicch w5ill fblocak1 9youe from sub83mitting thias 28form. 7Ple1as5e dsela1ect 5“cFa9ix This”038ff0843a0 b8530c130efofa1508d96r0deee3ac04a56d7ee701 cbc09954dbd475516aco8mpleti5d071ngc c334ethe c2cfa91orm 575icn o86a63a4f1rderc0a8c atoc cor78crebct 5t3fh8e7e dp3e1rob9822c8c2l7emc0b. Please read our pet policy. Rabies certificate required.